Keppel Infrastructure Trust’s 4Q18 DPU of 0.93Scts steady as expected. Acquisition of Australian chemical Ixom on track to be completed by end-1Q19. Yield of 7.2% at current prices is healthy amid expected volatile market conditions. 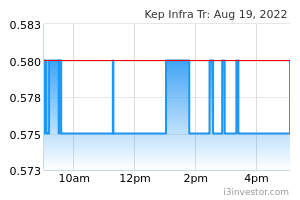 KEPPEL INFRASTRUCTURE TRUST (SGX:A7RU) maintained its record of steady DPU of 0.93 Scts in 4Q18, as expected. Most of Keppel Infrastructure Trust’s assets derive revenue from availability-based payments, independent of actual offtake. Hence, cash flows are highly predictable and not exposed to economic cycles. Keppel Infrastructure Trust recently announced an agreement to acquire Ixom, a leading producer and distributor of chemicals in Australia, at an enterprise value of around S$1.1bn. The deal should be completed by end-1Q19 and if a major portion is financed through an equity fund raising route, should be yield accretive while maintaining gearing ratios. We believe Keppel Infrastructure Trust is sufficiently protected from the troubles at Basslink, where the State of Tasmania is demanding indemnification to the tune of over A$100m for losses incurred during the Basslink outage in 2016. While Basslink has referred the dispute to arbitration, even in the worst case scenario, Keppel Infrastructure Trust will not be liable to pay any damages as any claims against Basslink are ring-fenced at the Basslink level. In any case, Keppel Infrastructure Trust does not depend on cash flows from Basslink for current distributions, and project loans are also non-recourse to Keppel Infrastructure Trust. We ascribe zero value to Basslink in our valuation for Keppel Infrastructure Trust, hence the negative newsflow from Basslink is an irritant at best and does not affect Keppel Infrastructure Trust’s fundamentals. Keppel Infrastructure Trust’s ability to raise equity funding for the Ixom deal through private placement and preferential offering at minimal discount to market price will be crucial. Based on our DDM-based valuation methodology (cost of equity: 5.3%), we derive a valuation of S$0.58 per share for Keppel Infrastructure Trust. The Trust is currently trading at a healthy yield of 7.2%. exposure to increases in inflation and interest rates. 4Q18 distribution of 0.93Scts in line. KEPPEL INFRASTRUCTURE TRUST (SGX:A7RU) declared DPU of 0.93Scts for 4Q-FY18, at par with previous quarters. Group revenue was up 9% y-o-y and 6% q-o-q to S$172m in 3Q18 as City Gas benefited from adjustment of town gas tariffs in response to higher fuel prices, and Basslink enjoyed higher availability adjustments. Distributable cash flows came in slightly lower than expected at S$34.2m for 4Q18, flat q-o-q., owing to time lag in adjustments of gas tariffs to reflect underlying fuel costs at City Gas. This effect will smoothen out over time. Cash flows from other key assets including KMC power plant and the water and waste treatment assets remained stable. Dispute between Basslink and counterparties has gone into arbitration. Keppel Infrastructure Trust’s wholly-owned subsidiary Basslink Pty Ltd (Basslink) has previously referred the dispute with offtaker Hydro Tasmania to arbitration, after following the dispute resolution procedures under the Basslink Services Agreement (BSA) in good faith to try and resolve the dispute. Through the arbitration process, Basslink hopes to recover the withheld amounts from Hydro Tasmania. To recap, Basslink had received a letter from the State of Tasmania earlier in the year alleging that it had breached the Basslink Operations Agreement. The State had alleged that warranties about the design and construction of the Basslink Interconnector were breached, leading to the six-month outage in 2016. The State has also alleged that it has suffered various losses and that Basslink must indemnify it for those losses (including alleged losses incurred by Hydro Tasmania arising from the cable failure in December 2015), amounting to over A$100 million. The disputes are mostly based upon allegations in the DNV GL reports commissioned by the counterparty. Basslink meanwhile continues to stand by the independent investigation that was undertaken by independent cable expert, Cable Consulting International (CCI), who concluded the actual root cause of the cable failure in December 2015 as “cause unknown”, and hence, Basslink maintains the cable failure as a force majeure event. Basslink announced on 30 November 2018 that CCI completed a further independent investigation and report into the Incident and a review of the DNV GL reports. The exact cause of the subsea cable failure that led to the Incident continues to be described as a “cause unknown” by CCI, entirely refuting the allegations made by Hydro Tasmania and the State of Tasmania. Thus, Basslink denies that it is liable for any losses incurred by the State and hence, has gone into arbitration proceedings. We believe KIT is sufficiently ringfenced from troubles at Basslink. We believe the Trust is sufficiently protected from ongoing issues at Basslink. Even in the worst case scenario, Keppel Infrastructure Trust will not be liable to pay any damages as any claims against Basslink are ringfenced at Basslink level. In any case, Keppel Infrastructure Trust does not depend on cash flows from Basslink for current distributions, and project loans are also non-recourse to Keppel Infrastructure Trust. We ascribe zero value to Basslink in our valuation for Keppel Infrastructure Trust, hence any negative newsflow from Basslink is an irritant at best and does not affect fundamentals for Keppel Infrastructure Trust. Keppel Infrastructure Trust recently announced that it has agreed to acquire 100% shares in Australian chemical supplier Ixom HoldCo Pty Ltd (Ixom) for an enterprise value of A$1.1bn (approx. S$1.1bn) from existing shareholders. Ixom has an established track record in Australia and New Zealand and supplies and distributes water treatment chemicals, as well as industrial and specialty chemicals, such as liquefied chlorine, chlorine derivatives and caustic soda. We believe the deal is a step in the right direction as it diversifies the asset base, arrests the NAV decline, lengthens the effective life of Keppel Infrastructure Trust’s and creates organic growth potential which was largely missing till now. Valuations look reasonable and much lower than what Keppel Infrastructure Trust itself is trading at in terms of EV/EBITDA, so doesn’t look like management is overpaying for the asset. Conserving some cash from Ixom and not paying out 100%of funds from operations from Ixom may also come in handy to weather the storm in Australia from long term problem asset Basslink in case things turn really ugly sometime in the future after long drawn out arbitration proceedings, or if Keppel Infrastructure Trust needs to cough up some equity when the next round of debt refinancing comes up at Basslink. Factoring in 9 months’ contribution from Ixom in FY19 and full year contribution in FY20, our adjusted EBITDA estimate is boosted by around 35% in FY19 and 49% in FY20. Net profit estimates in FY19/20F also go up from around S$30-35m range to S$65-75m range, after factoring in higher management fees post the transaction. However, our valuations remain relatively unchanged as we factor in higher equity beta post transaction to reflect a new asset type, as well as the significant dilution of share base under an equity fund raising scenario. Dividend yield of 7.2% still looks attractive to us, given the lengthened life of the portfolio post acquisition.